Kerr Pump & Supply is an official distributor for AMTROL water system solutions for storage, treatment, heating, expansion and flow control. AMTROL was founded in 1946 and has been the leader in the design and function of the vital mechanical systems that are used to control hydronic heating and to store potable water. 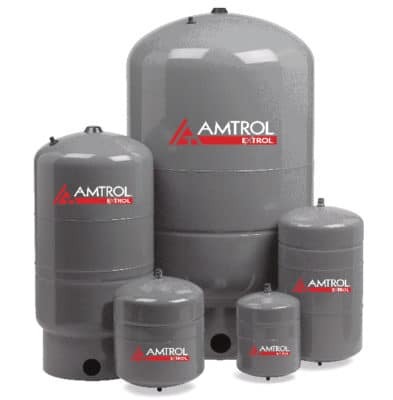 AMTROL products include water system solutions for storage, treatment, heating, expansion and flow control, along with a host of related HVAC products serving the residential, commercial, and industrial markets. Amtrol Inc. invented the first pre-pressurized well tank over 50 years ago. This revolutionary product uses a hoop ring and groove to lock the diaphragm, liner and shell together in a totally unique way. The Well-X-Trol utilizes high strength steel to deliver 150 psig working pressure – 20% higher than competitive well tanks. Backed by an industry leading 7-year warranty and now includes an antimicrobial liner to deliver Clean Water Technology in every tank. Thermal expansion tanks help control pressure in a closed, potable, hot water system. This eliminates pressure relief valve discharge, saves energy and helps protect expensive hot water heaters. Additional new features include 50 psi precharge, fresh water turbulator and antimicrobial liner, which neutralizes bacteria on contact. Amtrol designed and patented the first Extrol diaphragm expansion tank in 1954 to control system pressure and help reduce energy consumption in heating and chilled water systems. Extrol is still the leading expansion tank brand, providing quality, reliability and innovation.